Just before Halloween, Nathan wanted to go to a haunted house created by some youth groups in town. I was thankful that the schedule for the haunted house included a 'tamed down' time for younger kids because, though he's fascinated by scary things, Nathan is easily scared and tends to dwell on creepy things when he should be going to sleep. I was also grateful that Zachary was involved with the haunted house, so he could tell Nathan about parts of it beforehand so Nathan was a bit prepared. The day before the haunted house, Nathan arranged to go with his friend, Liam. When we got there, Liam's whole family was going, but Nathan still wanted me to go, too, so we let Liam and his family enter ahead of us, then we followed right behind them. It ended up being the perfect arrangement. Everyone who was going to jump out suddenly jumped out as the people ahead of us approached, making it much less scary for Nathan. Though he was terrified at the start, Nathan loved it and (as a bonus for us both) was not scared at all when he went to bed that night. Sometimes it's just easier to do hard things when we don't have to do them alone, even if it's something we really want to do. When God told Moses that he would be the one to set the Israelites free from slavery to Pharoah, Moses didn't think he was the right one for God to send. "Moses protested to God, 'Who am I to appear before Pharaoh? Who am I to lead the people of Israel out of Egypt?'" (Exodus 3:11). God didn't then launch into a list of Moses' qualifications or reasons why He chose Moses for this job. He simply said, "I will be with you" (v. 12). Moses continued with his questions, and God patiently answered them, showing Moses how He would prove to the Israelites that God had indeed sent Moses. Then Moses went back to his own lack of qualifications again, "O Lord, I’m not very good with words. I never have been, and I’m not now, even though you have spoken to me. I get tongue-tied, and my words get tangled" (Exodus 4:10). To that, God responded, "Who makes a person’s mouth? Who decides whether people speak or do not speak, hear or do not hear, see or do not see? Is it not I, the Lord? Now go! I will be with you as you speak, and I will instruct you in what to say" (v. 11,12). Even that wasn't enough for Moses, though, and he pleaded with God to send someone else. God relented; "All right...What about your brother, Aaron the Levite?...I will be with both of you as you speak, and I will instruct you both in what to do" (vv. 14,15). That, finally, was enough for Moses. Before He went up to heaven, Jesus assured His disciples, "Be sure of this: I am with you always, even to the end of the age" (28:20). Whatever we have to do, we can be sure that we are not going to do it alone. Do you have something you want to do, but it's a bit scary? Or is there something God is asking you to do and you don't feel qualified for it? Either way, God is saying to you, "I will be with you." And if that somehow still doesn't feel like it's enough, He may send a friend to help share the load. 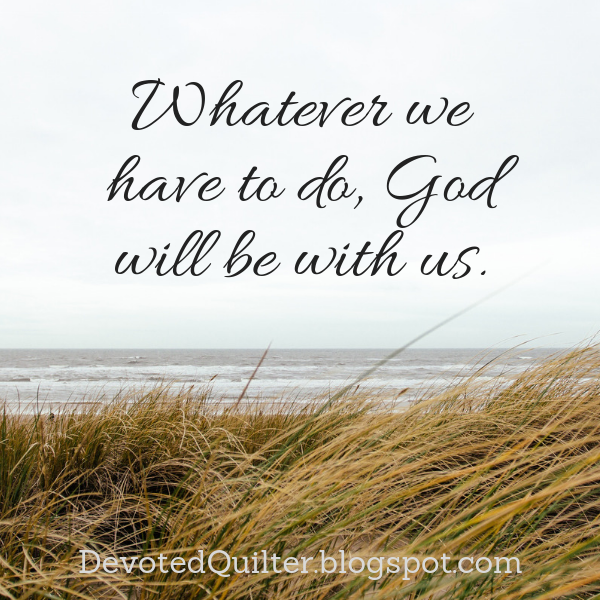 Whatever it is we have to do, God will not leave us to tackle it alone.